Your dog is closer to the wild than you think! The diversity of dog breeds may well be great and expanding, yet the representatives of all the breeds still have one thing in common with their shared ancestors, namely their digestive system. This works in exactly the same way as it always has done, since primeval times. In nature all wild species of dog, whether large or small, from young to old, eat according to their energy requirements from one and the same source of food! Our Farm Food Philosophy is based on this fact, and on our principle of “dogs come first”: one type of food that is suitable for all dogs. Because it is true for our dogs, just like for other animals that have long lives, that at various stages in life more or less food may be required, but it is not necessary to eat a different type of food. Farm Food’s composition and quality ensure an optimal biological balance. We constantly receive messages from users, breeders, dog trainers and instructors, groomers, vets and homeopathic vets, telling us about the positive and, where necessary, problem solving influence that Farm Food dog food has on dogs, from top to toe, from nose to tip of the tail, inside and out! We are also aware then that you can’t find better ambassadeurs for our philosophy than the dogs themselves! Because trying something out says more than a thousand words can ever say, we are pleased to invite you to try the “proof of the pudding”: allow your dog(s) to convince you of the quality of Farm Food. With kind regards, on behalf of the Farm Food Team. There is more to quality than just a good product! High quality standards and strict quality control. These result in a clean and pure quality product. that are suitable for human consumption. Our products do not contain artificial fragrances, colours or flavours. 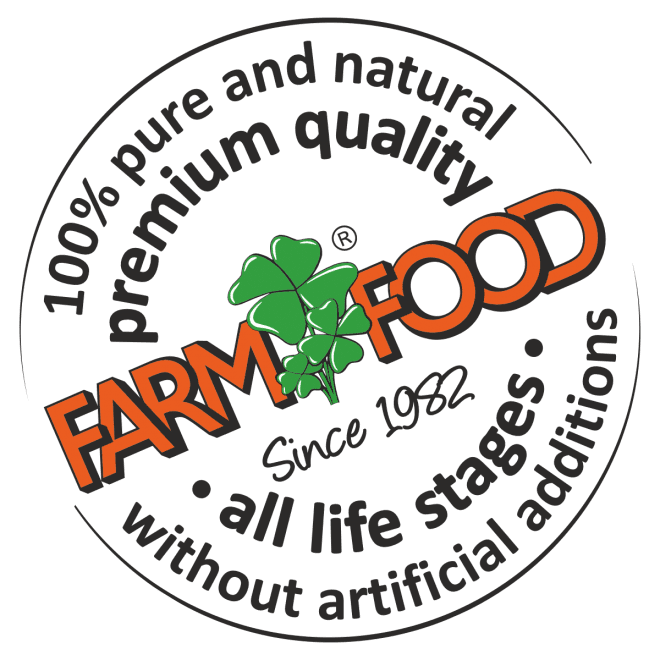 Farm Food: natural and pure dog food, since 1982.